A Hole New World, from Mad Gear Games, is a retro-styled action game where dropping down through holes reverses gravity and turns the world on its head. The player takes on the role of an alchemist who tosses potions at his enemies, which adds a bit of extra challenge - especially in upside-down areas - since he tosses them in an arc. 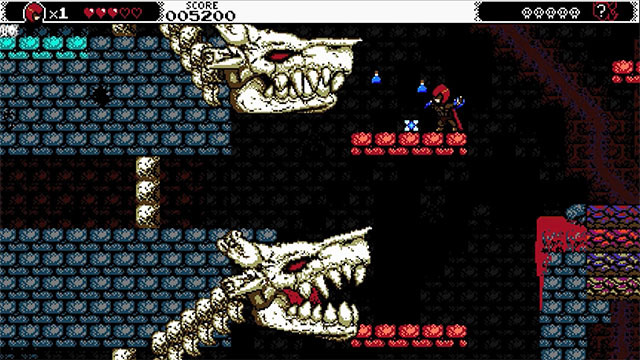 Different kinds of potions have different effects on enemies, with red potions igniting them in flames, and white potions bouncing and freezing them. The player also gains a charge attack that allow for a more direct assault on his enemies by firing off energy blasts that penetrate multiple foes in a row. The game is headed to PC, Mac, and Linux via Steam and is slated for release in December.